Deciding if you should sell digital downloads from your website vs. marketplaces? Access the pros and cons plus a comprehensive setup plan in this how-to guide. 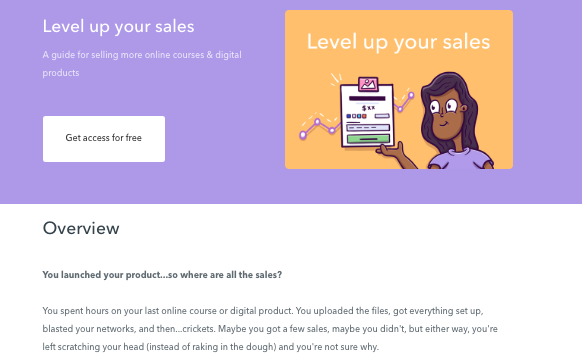 So you’ve got a decent website up and running, and now you want to start monetizing your business by selling digital downloads. You have a general idea of what your next steps entail, but as you research digital product options, you find yourself inundated with choices. No worries, let’s cut through the plethora of possibilities and get you some clarity for your business. We’ve put together this step-by-step guide for you on how to create, set up, and sell your digital downloads. But first, here’s some insight for deciding whether to sell digital downloads on your own site or using a marketplace. Before we go any further, let’s clarify what we mean about marketplaces. A marketplace is typically a conglomerate ecommerce site where third-party companies can sell their products or services to consumers. Marketplaces like Amazon, Etsy, and Shopify take care of the transactions and processing. OK, with that out of the way, here’s a brief summary of the advantages and disadvantages of using either your own website or a marketplace for selling your digital downloads. Most third-party marketplaces charge you a pretty penny for listing your items on their platform. And marketplace giant, Shopify, charges $29, $79, and $299 per month for their respective basic, standard, and advanced membership plans. So by listing on your own site, you enjoy the advantages of using your own charging model (i.e., recurring, discounts, upsells, cross-sells, single payment, or et cetera) and you can avoid the additional miscellaneous fees that marketplaces tend to tack on. Plus, you won’t have to worry about monthly membership fees. The only fee you may have to worry about is the payment processing fee, which makes finances beautifully simple with your own website. By using your own site, you also have the freedom to customize your selling experience, keeping the design, functionality, and nurturing process all on your terms. I.e., you can present beautifully clean, simple, and delightful user experiences to your clients without being confined to the format of monstrous marketplace user interfaces. 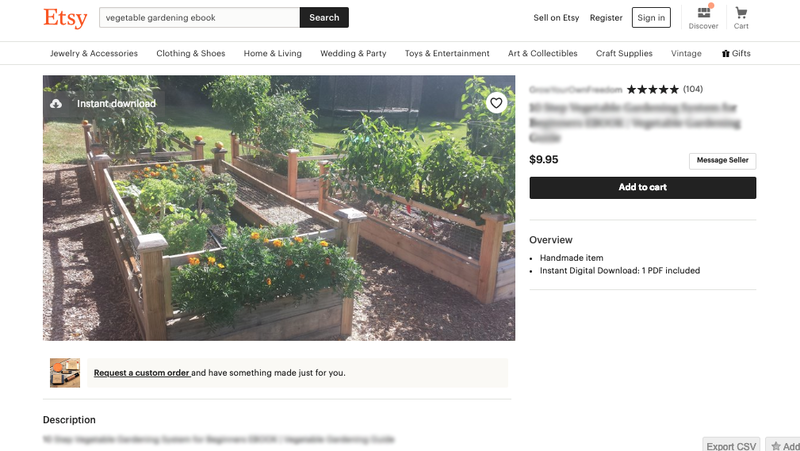 As you can see, the product -- a gardening kit -- looks generic, which makes it difficult to stand out from your competition, and there are numerous link and menu option distractions at the top that can derail your audience from converting. Here’s the comparative example from Jason Barg of Vegetable Gardening Life that presents his offer in a clean, beautiful way, where his products aren’t competing with thousands (if not more) of other options, featuring one main call-to-action (CTA) and zero clutter. That’s not the only advantage of controlling your user experience, though. When you use your own website, you also have the opportunity to track and nurture your visitors through their buyer journeys. You can interact with them at various touchpoints, find out more about their buying behaviors, and accommodate their individual needs. So when you host your own storefront, that means you can capture your audience’s emails and nurture your relationships with them through personalized email sequences. And how important is personalized vs. non-personalized email when it comes to your conversions? Pretty important. Which means you’ll want to capitalize on the ability to gather your customer emails so you can enhance both their user experience and relationship with you. So owning your data is another big perk, where you have full reigns of your site’s design, functionality, and nurturing process. But we have one more pro for you in this category. 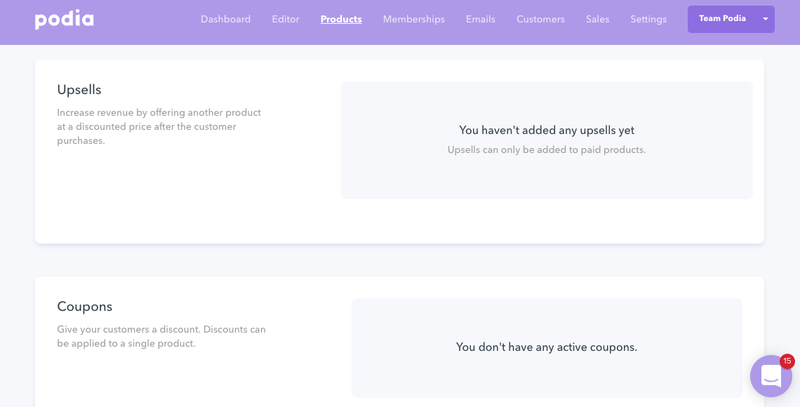 Typically, each marketplace has a limiting seller’s subscription plan that only allows you to sell a certain amount and type of products within specific rules and parameters. Using your own site gives you the freedom to customize your product offerings as you please, whether it’s the quantity, size, frequency, look and feel, descriptions, terms and conditions, pricing, free updates, bonuses, and et cetera. It’s your world. 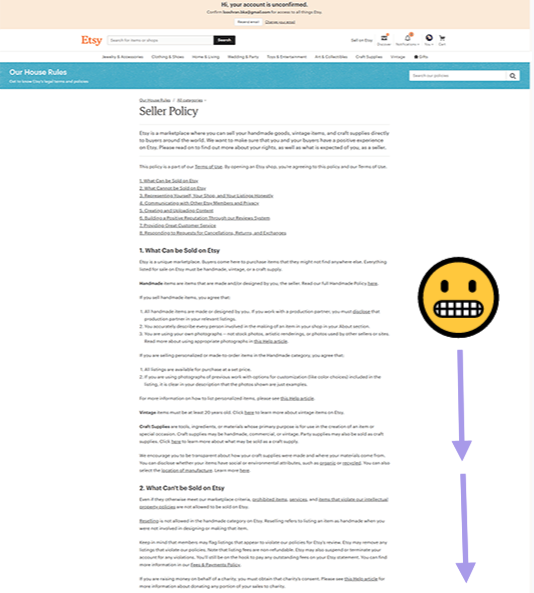 That said, nothing is without its flaws, so let’s take a look at the major downside of selling from your own site now. This one’s more of a caveat than a hard con: contrary to an all-inclusive platform that uses a subdomain, if you’re using site builders like WordPress, you’ll likely need some moderate coding skills or a stellar developer at your side. Because content management systems (CMS) like WordPress are designed for flexibility, their core architecture is very basic (aka slightly more robust than a blog). Which means you’ll more than likely need to hunt for third-party plugins, codes, extensions, and et cetera to accommodate everything you need to sell your digital products. To make WordPress site do what you want it to do, you’ll need to do some significant customizing. Some of the bells and whistles you may want to incorporate include: a widget to accept payments, log-in area, a way to view and manage your hosted content, a backend tracking system, and so on and so forth..
OK, but how do marketplaces stand up against out three pros and one con for selling on your own website? Let’s take a look. The biggest reason to use marketplaces is the amount of traffic you’ll have access to by publishing your store account. You’ll have exposure to millions of users each month, where customers just use the search query to find your store. Heavily-trafficked marketplaces have the advantage of attracting the mass audience, which means your digital products have the potential to end up in someone’s relevant search query. Beyond traffic volume, there’s one more marketplace benefit we’d like to point out. 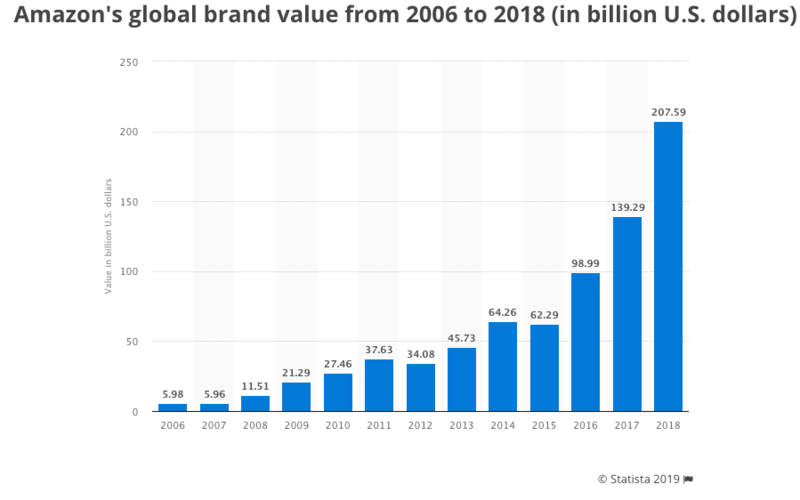 Even if your own brand isn’t well-known, being associated with big brand names like Amazon, Etsy, Shopify, and the like can bring you some clout. Take Amazon for example -- 53.4% of people are more willing to purchase from an unknown brand if the item is listed on Amazon’s marketplace vs. any other store site. Traffic and brand equity are the two main pros for using a marketplace. Now for some cons. The biggest glaring drawback of using a marketplace is the fees involved. 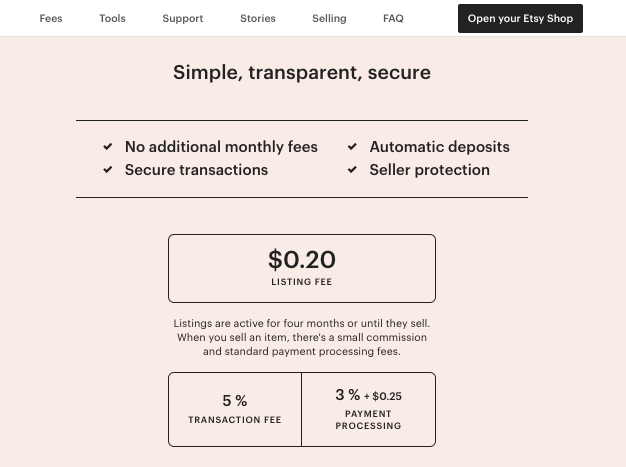 As I mentioned earlier, whether it’s a listing fee or transaction fee, you’ll likely need to pay additional premiums to host your digital products on their platform. Because these marketplaces are typically large operations, you’ll likely have to wait a significant amount of time before seeing the funds in your bank account. The user experience for your prospective customers is likely to be less than perfect, with fragmented pieces -- like your user interface, branding, content hosting, and on-page delivery -- all “frankensteined” together. Finally, if your new customer wants to return to your storefront to purchase more, they’ll be confused about where to go as the central hub for relevant info. Do they go back to Amazon, the Kindle app, or to your website? And who’s email do they reach out to? These are all segmented pieces of the customer experience to consider when using a marketplace. And there’s one final con for you. We shared with you the various limiting business restrictions that come with marketplaces (i.e., Etsy’s long scroll of house rules). In addition to the various terms of an agreement, product and listing restrictions, branding constraints, and et cetera, you should also look out for file size limits, which varies across platforms. File size limit is 20MB for Etsy, 25MB for Gumroad, 2GB on Amazon, and 5GB on Shopify. When you’re selling digital downloads (especially if you have several of them), you’ll likely need to use up a lot of that hosting space. And who wants to pay for more space? The benefits of using your own website and an all-in-one platform to sell digital downloads far outweigh the disadvantages. So, how do you do it successfully? By following these nine simple steps. 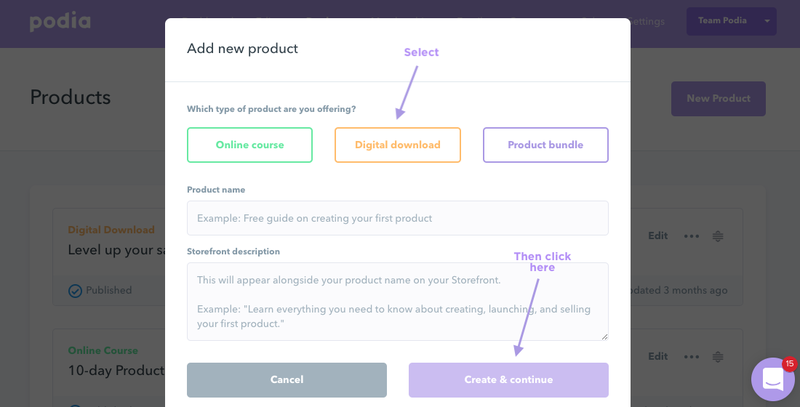 First things first: Decide on the type of digital products you want to offer your audience. Determine the goal for each digital offering and ask yourself why you’re offering it to your audience in the first place. What results do you want your audience to achieve? What can they gain by investing in your digital download? Some options for you to consider as far as formats go include: templates, cheat sheets, ebooks, assessments, tools, guides, and checklists. To help you get started, here are three great examples of digital downloads and their price points. These are all helpful pieces of content that your audience can benefit from, but the sky’s the limit. The main takeaway is to focus on providing value and delivering a specific result to your end user. On to our next step, which is creating your digital download. Once you have a clear understanding of what exactly you want your deliverables to be, time to let your creative juices flow and craft your digital products. If you’re looking for a done-for-you way to create your digital downloads from start to finish, you’ll want to use our digital download generator tool. Within 10 minutes, you can fill in some form fields about your download, and it’ll pump out a finished product for you. To accommodate various digital download formats, the generator also tailors your form fields to match either a checklist, numbered list, or text and images, so there’s something for everyone. Once that’s finished the next steps are easy-peasy. If you’re using an all-in-one platform, you directly upload your files. All other design elements, such as functionality and the way your items are laid out on the page, are taken care of for you. 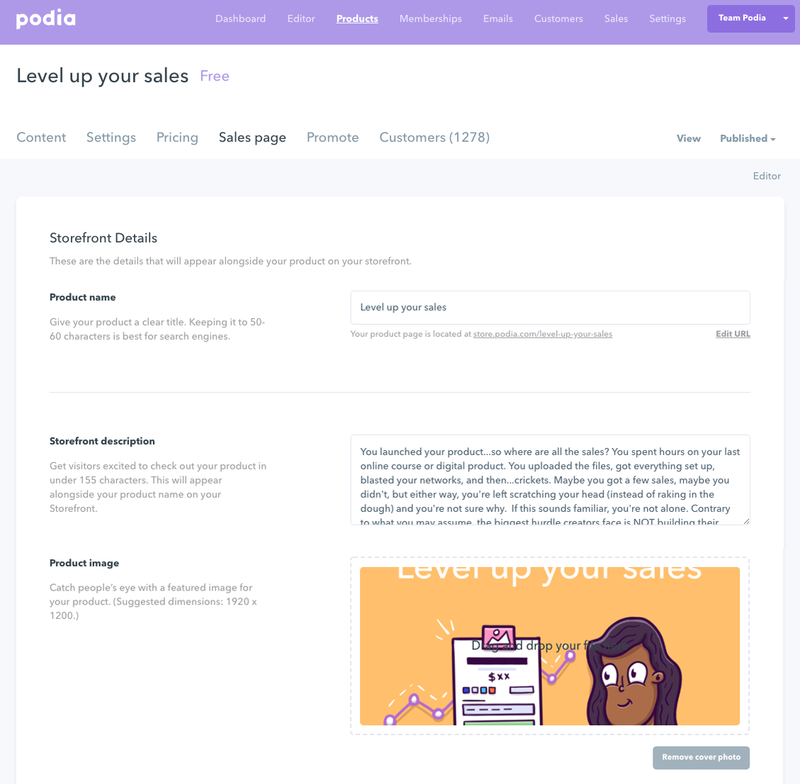 For simplicity’s sake, we’ll walk you through Podia’s dashboard as an example for the entire setup process. After you click “add files,” another modal window pops up where you can drag and drop your files into the window or click “upload” to pull the file from your drive. Nice work -- now your digital downloads are uploaded, hosted, and ready for your audience to access. The great thing about using a subdomain is you can have a third-party platform manage and host your entire digital products storefront, while still having full control over your content and branding. Or enter a custom domain for one that you already own. If you prefer the second option and want to have your own fully-branded domain, you can use your own purchased domain and set up a CNAME record with your custom domain name. For exact steps on how to set up your custom domain and details on your registrar of choice, you can reference this guide. Simple as that. Now for your payment system. Use an individual payment service platform: You’ll need to go this route if you’re not using an all-in-one platform. Payment processing services like PayPal or Stripe offer you the ability to collect fees, securely and conveniently online. Their services come with a price, however, with both PayPal and Stripe collecting 2.9% + 30 cents per transaction. To set this up on your own, using WordPress as an example, you can download either the WordPress PayPal plugin or WordPress Stripe plugin and follow along with their instructions. 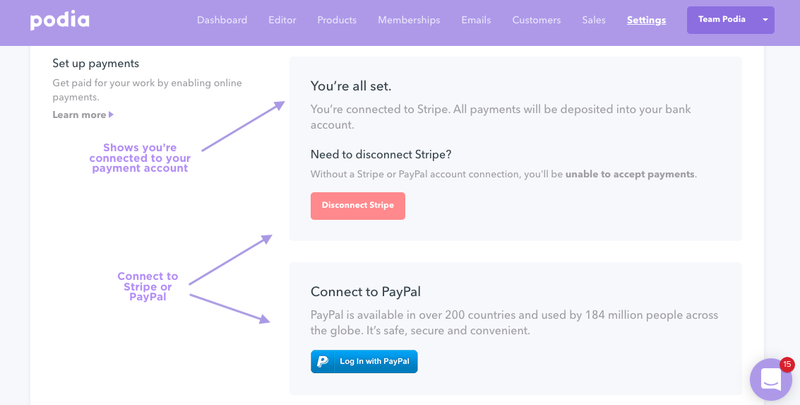 Use an all-inclusive platform to handle your payments: To continue with our setup example using Podia’s dashboard, the connection process to PayPal and Stripe is built in. Navigate to “settings” in the top menu and scroll to the bottom of the page. Then click the button offered for either payment party option and follow along with the steps to connect to your bank (I’ll avoid displaying screenshots of private bank account info here). 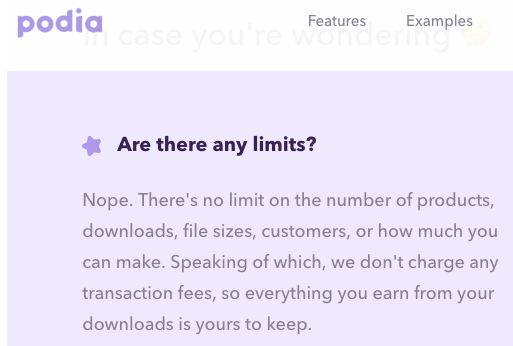 Boom -- your pricing is all set up and connected to your bank account, which means you can immediately start accepting payments for your downloads. The next step is to put some finishing touches on the layout of your digital downloads page. It’s now time to set up the page where you customers access your digital downloads, referred to as either your sales page or storefront. Next, give your storefront a headline to further entice your visitors to convert. Tip: Test out different headlines to better convert your visitors. In some cases, merely changing a headline increases conversions by 52.8%. Need some instruction on how to create a decent sales video? We have a guide on how to shoot quality video from your iPhone and a how-to on recording videos for online courses that you may find helpful. Once you have your storefront design elements all locked and loaded, now comes the exciting part of publishing your page for all to enjoy. This makes for a clean and well-branded user experience. Plus, you can avoid generic branding, a choppy user experience, and unnecessary distractions of a marketplace platform. Now, we have just two final steps for you. At this point, your digital downloads are all primed and ready to share with your audience. Use it as an intro to your services - By offering a scaled-down digital product with a lower price point, you can introduce new audience members to your business, warm them up to your brand, and then nurture them toward your higher-ticket items. Bundle your digital downloads - You can package several of your digital downloads into bundled offerings to make more money while improving convenience for the customer. These are just a few of the formats and ways to use your digital downloads in your marketing effort. For a full list of marketing strategies (aka methods of attracting your target audience to these formats), check out these 16 fool-proof marketing strategies and these additional 8 marketing strategies for new products. But once you have some traffic flowing to your digital downloads, don’t stop there. It’s time to track your storefront activity. By keeping a close eye on your metrics, you’ll be better equipped to grow your business. You’ll have a better understanding of which items are most popular among your audience -- these are the digital downloads you can double-down on in your marketing effort while tweaking the products that aren’t resonating with your audience. From here, click on the “customers” tab to view all your digital download customers. This gives you a quick and easy way to track how many of your audience members have accessed each digital download. Another way to track your traffic stats is to integrate your site activity with Google Analytics, which you can do by heading to your top “settings” menu, scrolling to the Google Analytics form field, and entering your tracking ID number. Notice the two additional form fields below your Google Analytics field. 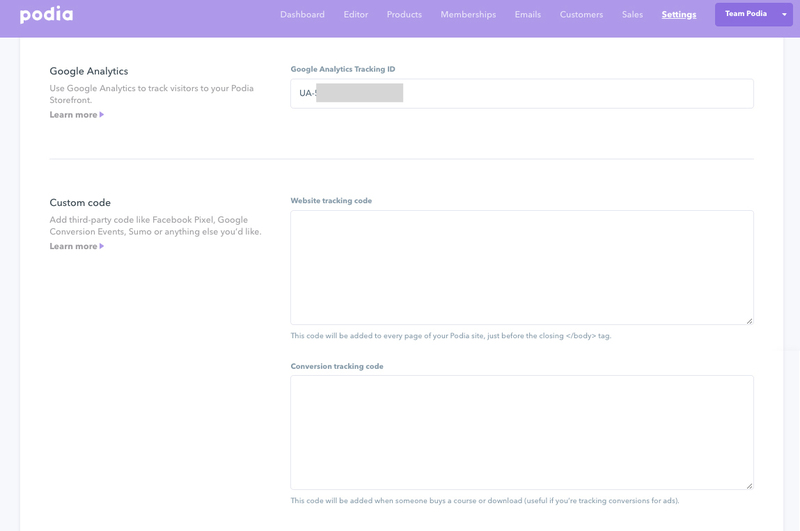 For those of you with other tracking needs, you can also add custom coding to the website tracking code and conversion tracking code boxes. 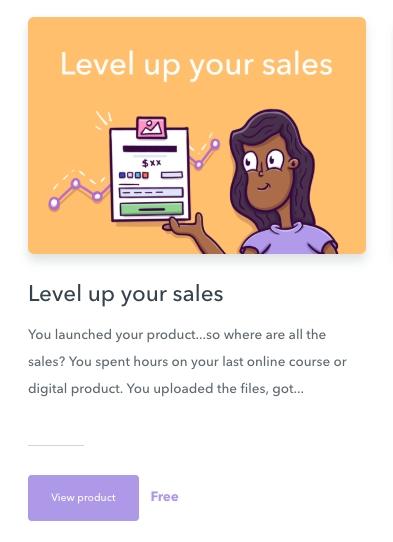 And with this last tracking step in place, a big congrats to you -- you’re officially all set up to make some substantial income selling your digital downloads. Choosing the best route for successfully selling your digital downloads doesn’t have to be a daunting process. There are pros and cons to using your own site vs. a marketplace to sell your digital downloads. Pros of using your own site include keeping your profits, better managing your customer relationships, and avoiding limiting business restrictions. Some cons of using your own site are needing coding help if you use sites like WordPress vs. an all-in-one platform with a subdomain. Pros of using a marketplace consist of having access to mass audience traffic and branding. And finally, some cons of using a marketplace are that you have to share your profits, wait for the funds to arrive in your bank account, endure a less-than-ideal customer experience, and deal with limiting business restrictions, including file size. To successfully set up a digital download storefront using your own site and subdomain, follow these nine simple steps. Start by figuring out which digital offering to sell. 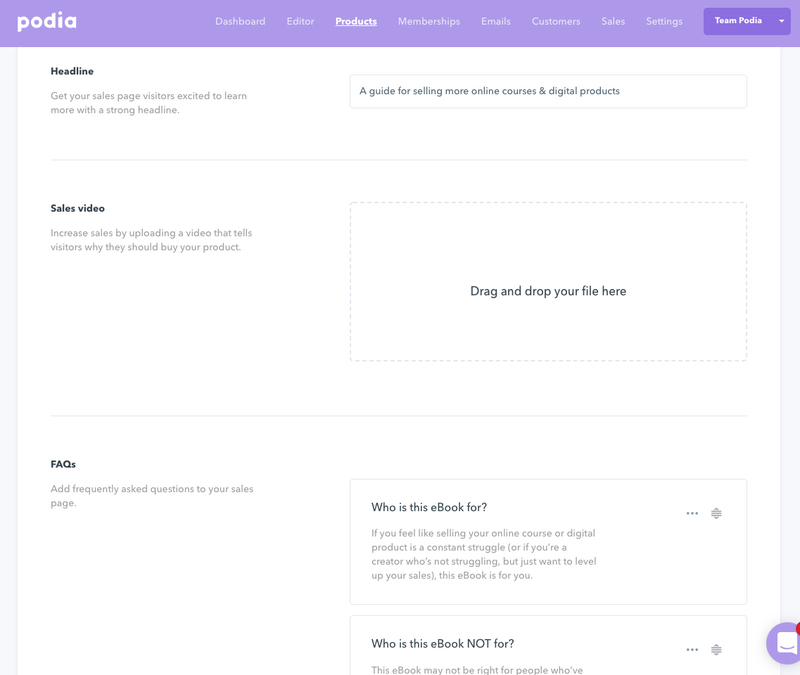 Formats vary from templates and cheat sheets to ebooks and tools. After creating and uploading your digital download, set up your subdomain, which gives you the advantage of both a cohesive customer experience and full support of a third-party platform that specializes in digital downloads. Then set up your payment system connecting to your banking account and design your sales page to match your own branding and personalized messaging. After you publish your content, market your digital download offerings to grow your audience size. Finally, track your metrics, including your traffic volume and sales, so you can double-down on the strategies and products that are most successful. The ease that comes with setting up and selling your entire digital download storefront using an all-in-one platform is well worth it. Plus, without the extra transactional fees involved, it’s more profitable than using a marketplace. 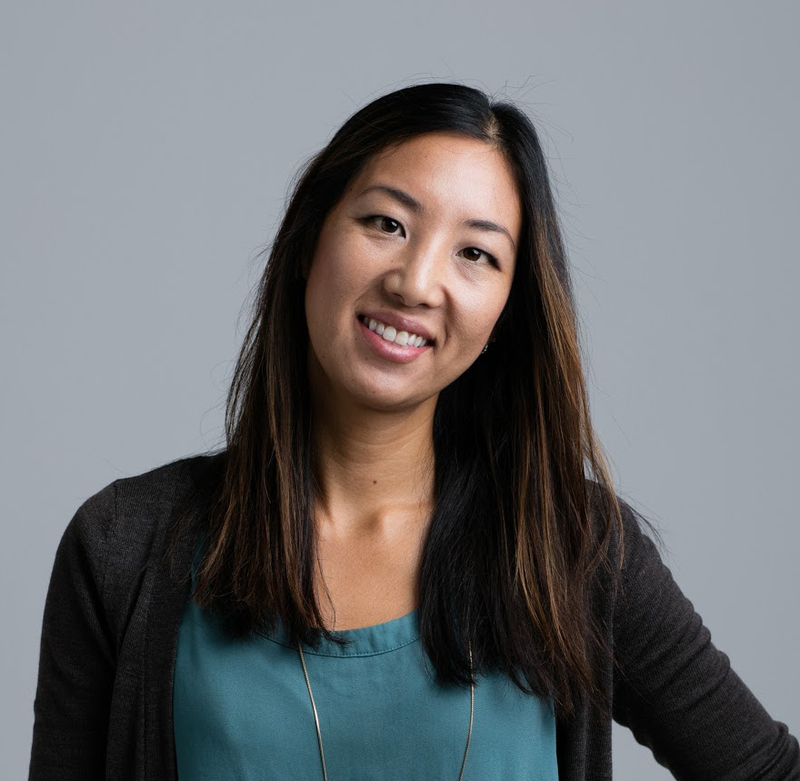 Cyn Meyer is a content marketer for Podia, an all-in-one platform where online courses, digital downloads, and membership websites -- alongside their creators -- thrive. Cyn also enjoys playing music, helping retirees live active, healthy, engaged lifestyles, and hopping into the ocean.